I’m watching 300 Rise of an Empire because that’s what I do on the weekends. Sometimes it’s just noise in the background. Sometimes I sit and actually pay attention. Sometimes I stop at certain moments just to take a good look. I am all about feeding my Sullivan Stapleton thing. When I first saw the picture above, I had a fangirl moment. 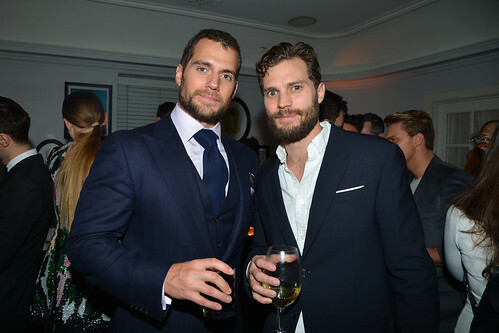 Henry Cavill and Jamie Dornan in the same space just makes me squidgy. I know we’re going to see LOTS of Dornan in the coming month or so because of that movie. And I want it known that I liked him BEFORE that movie and I will like him after that movie and I believe he will be the best thing in that movie. If it gets panned, I think he will be the bright spot. It’s just a bummer that he had to be clean shaven for the role. His scruff/beard just seems more his real face than the clean shaven version… And of course, I think Henry looks awesome in his current look. Short hair and scruff? YES PLEASE. I hope the look is part of a new role. I’d LOVE to see that look on the big screen. Although the shorter hair makes his head look a bit small or something. LOL I keep noticing how small his head looks in some of the more recent pictures. Maybe it’s the angles. Or maybe he’s standing with people who have big heads. AWESOME pic. 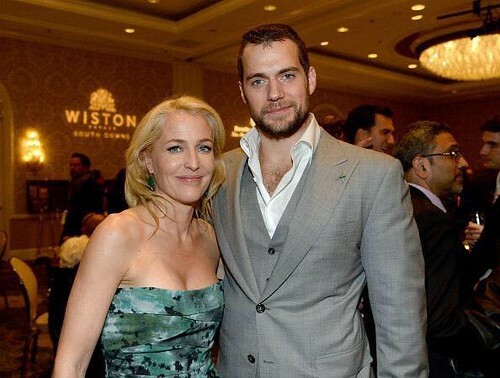 I’d totally fangirl if I got to stand with Gillian Anderson. She just keep getting more gorgeous. 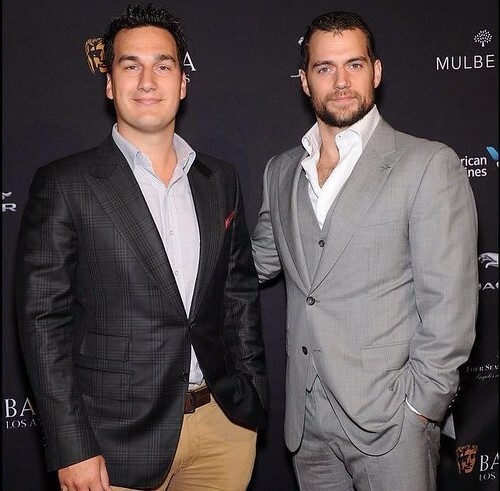 And of course, I’d be smiling like that if I got to stand with Henry. HULLO! There’s also a shot of them with Chris Evans from the night before the pic above. Too much hotness in that one! Wait, is that possible? Henry doesn’t look much like his brothers (to me) but his brothers look like each other (the two I’ve seen). Handsome, of course. My Most Popular Tweet (yes, I am going to refer to it in capital letters) is still getting faves. I LOVE IT! And I need to stop talking about it but it just delights me to no end. I love that so many eyes are seeing that pic of me with the boys. LOL And I’m still so stoked that Joel tweeted that picture with Sully AND he replied to me when I asked how he knew Sully. Freakin’ sweet, that one. Unbroken – Most of my praise for this movie belongs to Jack O’Connell. The young man has scary wells of talent and he did such a great job on this movie. Takamasa Ishihara was also quite amazing as Watanabe, playing him with such complexity beyond the sick brutality. I want to say I’m not really into war dramas but I have enjoyed different ones over the years. This one seemed a bit slow in parts, especially after starting so hot with all the action (and seriously, couldn’t Jai Courtney had had more screentime?). It’s definitely a well made and well acted film, a testament to the will to survive as well as the power of forgiveness. Into the Woods – I haven’t seen the musical (yet) so I went into this movie with fresh eyes and only a slight understanding of the story. My favorite moment, of course, was the princes and “Agony.” Chris Pine as Cinderella’s Prince was my personal highlight and Meryl Streep was great as the Witch. I have a feeling that those who’ve seen the musical will say they prefer the stage production more than the movie. Some of the deaths surprised me (yes, there are deaths) but overall I thought it was well acted and well made. But for me, it all suffered a bit in the pacing. The last part of the movie just didn’t seem as put together as the rest of the movie. But I think “Agony” is probably worth all the flaws. The Imitation Game – Benedict Cumberbatch is amazing in pretty much all he does. I cannot help but be drawn to him whenever he’s on screen. He commands that kind of presence for me. It is no different in this movie. It’s more than the words he speaks, it’s the expressions flitting across his face, the movement of his body. The supporting actors in this movie were also great to watch (my personal favorites being Mark Strong and Matthew Goode). Another wartime drama though outside of combat, this movie excels in its plot and pacing, its actors impeccable. Jack O’Connell is definitely an actor to watch. The young man is quite talented and his work so far has me has impressed me so much. He reminds me of Tom Hardy with his intensity and commitment to his roles. And he’s quite a chameleon. You might not recognize him from role to role. How many actors can do that, whatever age? Chris Pine always surprises me and you’d think I’d be past the surprise when it comes to him. I can pretty much watch anything of his and then I’m reminded how awesome he is. I think he might be a bit underrated. Or maybe I’m just super partial. Benedict Cumberbatch is one of my favorite actors, based purely on the fact that when he’s on screen, I am captive to him. I might not like him “that way” but he’s still one of my favorites. I don’t think I can think of anything I’ve seen of his that I haven’t liked. But I haven’t seen everything. And if you read this whole post, I adore you.